Hoover Dam is a large dam in a canyon of the Colorado River known as the Black Canyon. The place is known as one of ten top construction achievements of the twentieth century. Hoover Dam attracts over a million visitors every year. It is located a few minutes’ drive from Las Vegas. Construction began in 1930. Despite its remoteness and poor building conditions, the dam was completed in less than five years, which is two years earlier than the prescribed period, and for less money than anticipated. It is named Hoover Dam in the name of the thirty-first U.S. president Herbert Hoover. He played a major role in creating the dam. Before being named Hoover Dam, the dam was called Boulder Canyon Dam, and Boulder Dam, but in 1947 its name was changed by Congress. Originally the dam was to be built in Boulder Canyon, so in official documents the name was Boulder, although it was not built in the canyon. Hoover Dam is located on the border of Arizona and Nevada. This dam is an unique hydro facility. Its height is 221 meters. As a result of the construction of Hoover Dam the largest artificial lake in the world has formed - Lake Mead. The initial project for the construction of the dam was only an architectural solution for a wall and building a hydro- electric station. The proposed project was criticized by many people because its excessive simplicity does not correspond to the style of the era. Finally the project was revised in the traditions of art deco. The upper dam was adorned with turrets, towers and water - clocks. One of them shows the time in Arizona and the other - the North American Pacific Time, as the dam is located on the border between the two time zones. Construction of the dam was necessary because of floods that occurred from the melting of snows in the Rockies. Its construction inspired hopes that the reservoir will boost farming with irrigation, but also will become a water source for Los Angeles and other areas of Southern California. To build Hoover Dam, four tunnels with a diameter of 17.1 m were dug in the walls of Black Canyon. Tunnels are stretched to the length of 4.9 km in total. 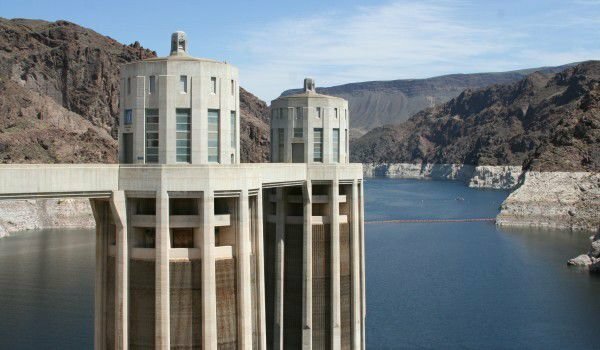 Today seventeen generators produce four billion kilowatts electricity each year and thus Hoover Dam is one of the most important hydro- electric station. Near Hoover Dam, Boulder City was built, where builders working on the dam live. During construction of the wall in the city were banned alcohol and gambling. To this day in this city, you can not gamble, and banning of the sale of alcohol was kept until 1969. This is the only city in Nevada where gambling is prohibited. Hoover Dam can be seen in many Hollywood productions - "Apocalypse", "Transformers" and others. In the popular science film "Life After People" Hoover Dam is presented as one of the last fragments of a civilization that will keep going ten thousand years after the disappearance of humanity. Hoover Dam is one of the most Visited sites in the vicinity of Las Vegas. To get to the tunnel under the Colorado River will help a lift, that leads to a marble turbine hall. Hoover Dam is considered one of the wonders of the industrial world and in the tunnel under the river has a whole museum, which presents all stages of construction of the dam.